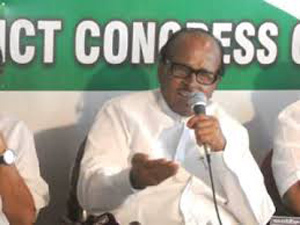 Udupi, May 17, 2015: Senior Congress leader Janardhan Poojary has slammed the BJP government at the Centre for its unfulfilled promises and dubbed the BJP as ‘Bharatiya Jhoot Party.’ ( A party of lies). Speaking to reporters here on May 16, Saturday, Poojary recalled the statement he made when the Modi government took charge a year ago, that he would not speak up against the government until it completes one year. “Now, going by the style of functioning of the government so far I am forced to say that it has turned out to be a Bharatiya Jhoot Party,” said Poojary. On the frequent foreign trips of the Prime Minister, Poojary said the former has not thought out travelling the lengthen and breadth of his nation to known the plight of the poor. “I do not know of any previous Prime Minister who has been on so many foreign tours as Modi in one year,” Poojary said and accused Modi of looting the nation’s resources. Even RTI queries on his foreign tour expenses are not answered by PMO, Poojary said. The erstwhile UPA government has always tried to strike a balance in the economy which is fluctuating now, Poojary added. He also hit out at the Modi government for failing to keep up its promise of bringing back black money in 100 days. The Land Bill is a bane to farmers, he said and added the government has failed to live upto the expectations of the people.